We are proud of the rich variety of awards and recognition won by our people. Their dedication, passion and vision help us all to care for patients. Our Consultant Nurse for Acquired Brain Injury in Children, Gilly Robinson, won the Nursing Standard Child Health Award for her work to develop CATNIP – a coma assessment tool that helps doctors and nurses to quickly recognise and respond to warning signs of brain injury and death. Professor Dame Tina Lavender was recognised in the BBC’s 100 Inspirational Women as one of the world’s top experts in midwifery. As an adviser to the World Health Organisation, she developed a board game which helps African midwives detect prolonged and obstructed labour to prevent women dying in childbirth. Amigdol Pradeep, Transplant Recipient Coordinator, received the British Journal of Nursing Nurse of the Year award for her fantastic work. Manchester Health Visitor, Shakila Shah deservedly won the Community Practitioners and Health Visitors Association’s National Health Visitor of the Year award. Health Play Specialist Janet Concannon has been rewarded for her exceptional contribution to sick children, with the national WellChild Award. Olivia Lingard was named Apprentice of the Year at the North West Adult Learners’ Week Awards in Health and Care in June 2016. Our Consultant Elbow and Shoulder Surgeon, Chris Peach, was awarded the inaugural Copeland Memorial Travelling Fellowship by the British Elbow and Shoulder Society in 2016 for his fantastic work. In October 2016, Macmillan Information and Support Centre Manager, Debbie Smith, was surprised live on national television and presented with a ‘Kelly’s Hero’ Award by ITV’s Lorraine programme. Sarah Monks, Lead Dementia Specialist Nurse, won the Best Dementia Lead/Nurse category in the seventh National Dementia Care Awards in November 2016. Research Hubs Nurse Manager Debbie Smith was honoured with a lifetime achievement award for her work facilitating clinical research studies and trials. She received the accolade at the 2016 Greater Manchester Clinical Research Awards. Consultant Chest Physician Dr Binita Kane won the ‘Emerging Leader’ category in the North West Leadership Academy Recognition Awards 2016. Dr Kane, is clinical lead for ‘integrated respiratory care’ at UHSM and is a specialist in treating severe asthma. Burns Nurse Consultant Jacky Edwards was named the Tissue Viability Nurse of the Year at the British Journal of Nursing Awards 2017. Jacky worked on introducing the use of compression therapy in both new and non-healing lower leg burns, which has led to quicker wound healing and in some cases earlier discharge for patients. Careers Engagement Lead Hilary Wyatt was presented with the Health Ambassador/Mentor of the Year Award at the 2017 Health Education England awards. Working together, we achieve so much. It’s no surprise that a variety of teams have won prestigious national awards. 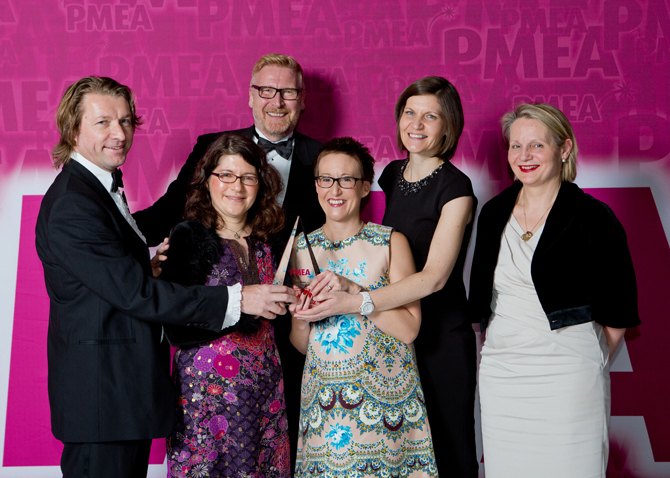 Our nursing and therapy teams picked up the Pharmaceutical Marketing Excellence Award (PMEA) for a significant, consultant led adolescent rheumatology project, which included the creation of new information booklets for patients and parents. The interventional radiology team at Manchester Royal Infirmary were named North West Radiography Team of the Year by The Society of Radiographers, in recognition of their excellent vascular access service. 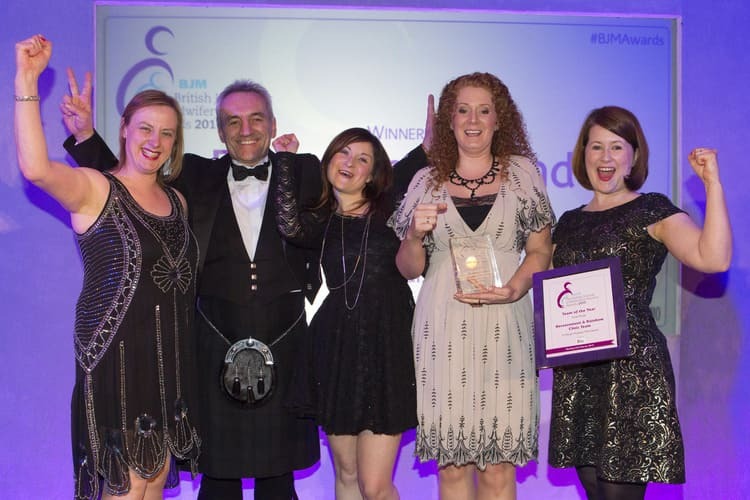 At St Mary’s, the bereavement service and Rainbow Clinical were also named Team of the Year, at the Journal of Midwifery awards. Another group of midwives made a big impact, when specialists Marie Zsigmond, Amanda Lewis and Siobhan O’Neill won the Team of the Year award at the Royal College of Midwives (RCM) Annual Midwifery Awards, for their project to identify and support potential victims of trafficking. The Ticker Club was awarded the Queen’s Award for Voluntary Service in June 2016, the most prestigious award for volunteers in the country. Based in the North West Heart Centre, The Ticker Club has provided moral support and raised funds for patients for 30 years. UHSM was awarded Gold Status by Health Education England in recognition of the quality of the learning environments the trust provides for all non-medical learners, including students from nursing, allied health professions and healthcare science. We are delighted to be home to a number of recognised Centres of Excellence, including Manchester Royal Infirmary for Paget’s bone disease, and the whole Trust as one of only six UK centres in the UK Precision Medicine Network. Several locations have also won prestigious awards. 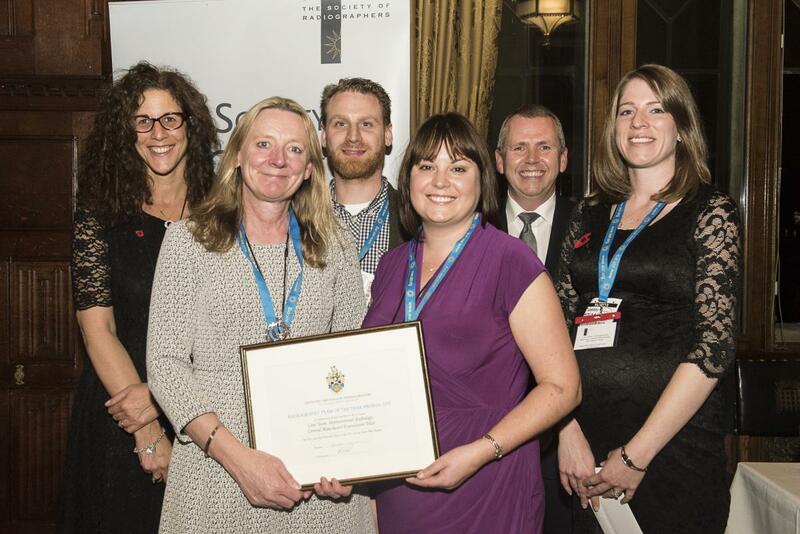 Saint Mary’s Sexual Assault Referral Centre scooped the top prize in the PENN awards. Manchester Royal Eye Hospital collected two Bayer Ophthalmology Awards – Best Ophthalmology Care Innovation, for leading work on a time-saving service for urgent patients, and Best Ophthalmology Team, for diabetes-related care. Ward 84 at Royal Manchester Children’s Hospital won a North West Pride Award for cancer care. This is particularly brilliant, as nominations came from families who stayed on the ward. Dr Sujesh Bansal from our Postgraduate Medical Education Department worked in partnership with HEE e-Learning for Healthcare (e-LfH) to develop an award winning online training programme for doctors new to UK practice. The Induction for International Doctors programme is live nationwide. Midwife Kirsti Redfern won the JOHNSON’S Mentor of the Year award at the Royal College of Midwives (RCM) Annual Midwifery Awards. She’s a shining example of how committed we are to supporting individuals’ personal and professional development. The Gulu-Man, Uganda Health Partnership Link, has been shortlisted for a HSJ award in the category for International health partnership, (the award is sponsored by NHS Employers and THET). The link has been shortlisted because of the sustainable approach to educational programme delivery, Gulu–Man Link. Helen Slattery is our Lead for Global Health. We have had along-standing healthcare education link with the Faculty of Medicine at Gulu University and the Regional Referral Hospital in Gulu, northern Uganda. This link gives health workers, students and academics in the UK and Uganda the opportunity to share skills and develop their learning through innovative ways.